West Oxfordshire’s Visitor Information Centres are getting into the Christmas spirit with gifts and decorations on sale – and are giving you the chance to grab a bargain during a special discount week. The VICs in Burford High Street and Welch Way, Witney, are offering 10% off of a range of items throughout the first week of December. All you need to do to receive the discount is quote code VICXmas2014 at the time of purchase between Monday 1-Sunday 7 December. Normal opening times are Monday to Saturday until 5pm and 10am-4pm on Sunday in Burford only. Witney VIC will also open from 10am-4pm every Sunday until 14 December from this weekend (November 23) to cater for the busy festive period. 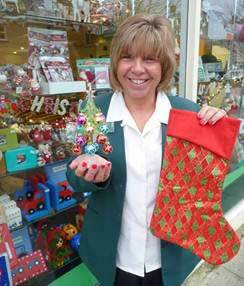 The VICs, which are run by the District Council to help promote West Oxfordshire and support the local tourism industry, are stocking a variety of Christmas products from tree and home decorations, stockings and present sacks, to gifts such as traditional wooden toys and stocking fillers.